If you have not treated yourself to a theatre experience before, then…this should be your first!!! 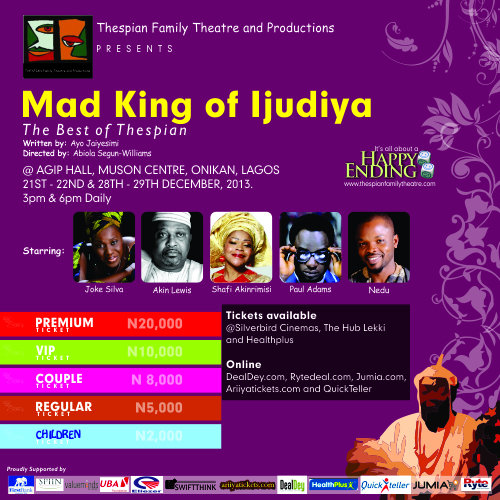 Thespian Family Theatre, a theatre production house, is returning with a stage production titled ‘Mad King of Ijudiya’. The production which features notable actors like Joke Silva, Akin Lewis, Nedu of Wazobia FM, Paul adams, Shaffi Akinrimisi, Michael Odiachi, Inna Eriza and and a host of others, will be staged at Agip Hall, Muson Centre. According to the production house, ‘Mad King of Ijudiya’ is electrifying and highly entertaining, yet educating stage play, brought to the Lagos audience with a rich blend of folklore, traditional dance and music that naturally transports the audience to a typical African village setting. It is very family friendly so parents do not need to leave their children out of the fun as there is something for both the young and old. Mad King of Ijudiya will surely be a good way to end the year 2013. The play is written by Ayo Jaiyesimi and directed by Abiola Segun Williams. It will be staged at Muson Centre, Onikan Lagos, on the 21st, 22nd, 28th and 29th of December 2013; with two shows, at 3pm and 6pm respectively. Tickets: VVIP 20 000 ; VIP 10 000; Couple 8 000; Regular 5 000; Children 2 000. Tickets available at Healthplus Ikeja, Surulere and Palms shopping Malls, Bruno’s place Ikeja, and online on dealdey.com, jumia.com, ariiyatickets.com, konga.com and rytedeals.com. I saw Crystal Slipper earlier this year and it was a blast of an experience. Theatre gives those moments that you savour for a long time. Previous PostInternet Bundles: When will Telecom providers listen to our cry?Next PostFrom Analogue to Digital Tv – Is there a possibility of Nigeria switching?